I got to help out during my daughter’s kindergarten class, and the teacher asked what everyone’s favourite Christmas cookie was. The vast majority of them, to my surprise, said GINGERBREAD! 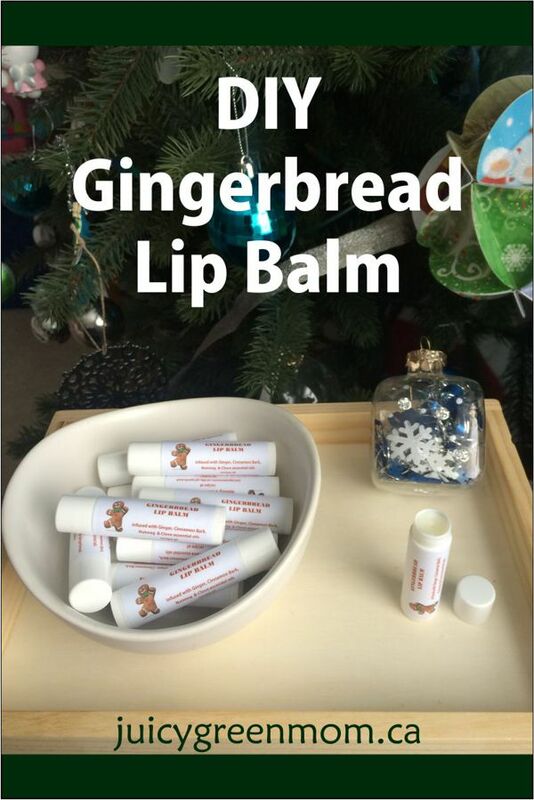 I knew I wanted to make fun little gifts with my daughter to give to her classmates for Christmas (kind of like the DIY purifying sprays we did last Valentine’s Day), so I thought – wouldn’t Gingerbread lip balm be a great little gift? The blend of essential oils I used for this recipe gives the lip balm a nice mild scent and flavour (make sure you use high quality essential oils!). If you like a stronger flavour in your lip balm, feel free to add a few extra drops of each oil. I wanted something subtle, not overpowering, so I’m happy with the amount of drops I used. 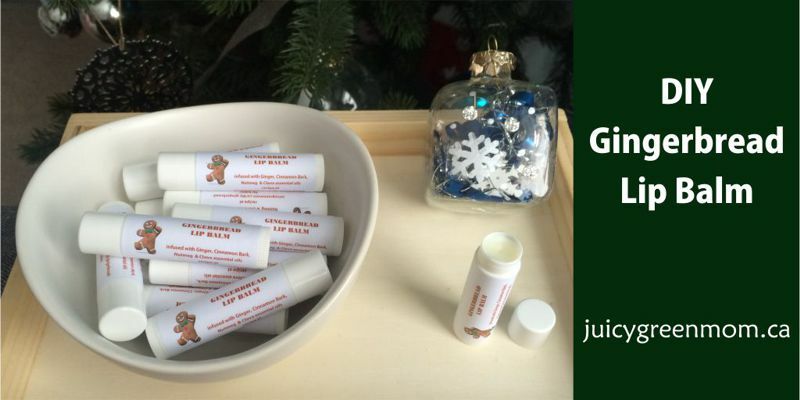 This lip balm is perfect to give at Christmas with its subtle gingerbread flavour! Stir and heat until it has all melted down to liquid. Remove from heat and quickly add the essential oils and stir. Pour into lip balm tubes and let cool to harden. I use a glass pyrex measuring cup in a pot of water so that I have a built in pouring spout. Works like a charm! Also, the trick I learned the last time I made DIY moisturizing lip balm was to use an elastic band around all the empty lip balm tubes to make it easier to pour. It definitely helped! This recipe filled 36 standard plastic tubes, so I had to be quick about pouring as it began to harden for the last few. We made up some cute little labels to put on the lip balm tubes – that I’m including here as a FREE PRINTABLE! I used these with the Ecofriendly Avery labels 48863 (made from 100% post consumer waste, water based adhesive, & processed chlorine free), which I cut in half so that I could get 20 labels on a page. My daughter and I are super excited to give these out to her classmates and other family and friends!